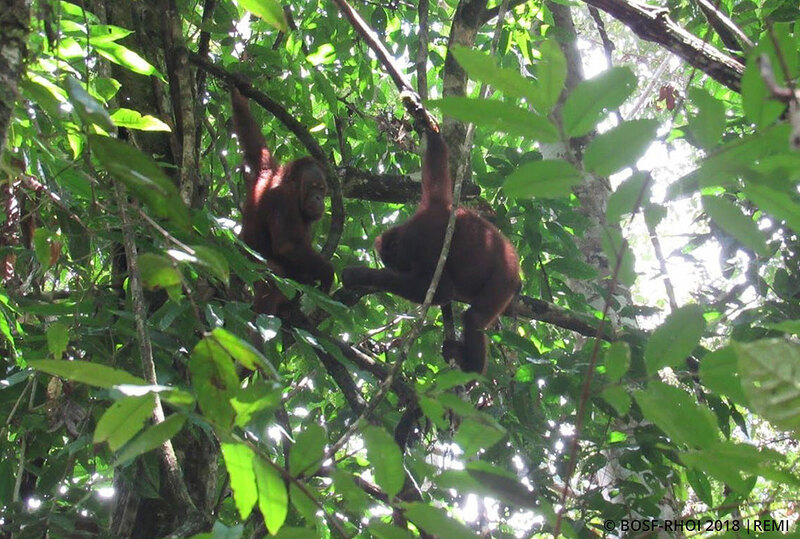 September 10, 2018 — Our Post-Release Monitoring (PRM) team from Nles Mamse Camp has been carefully observing the six newest residents of the Kehje Sewen Forest since their release on August 28. 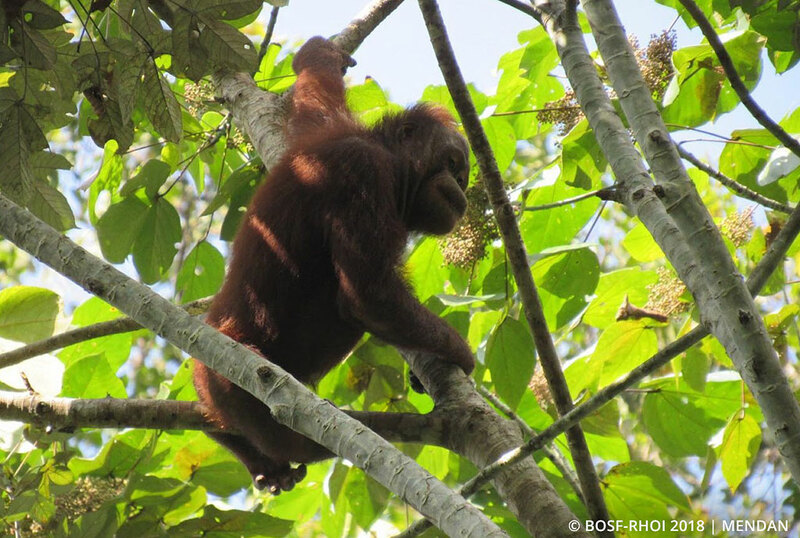 The six orangutans were released to the forest at around noon, and the PRM team immediately set about conducting release-to-nest observations. Quiet and alert Mads, an 8-year-old male, spent his first few hours in the forest observing his new surroundings. He rested up in the trees, and cautiously climbed down every now and then to forage for shoots. Our team members had to be very careful in their observations on Mads, for he is known for his firm dislike for human presence. In contrast, Menur, an 11-year-old female, moved around a lot and actively played. 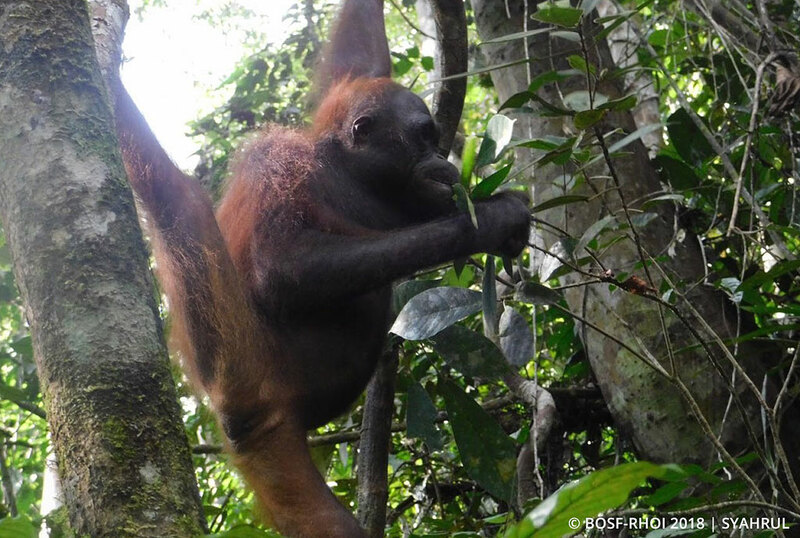 She quickly explored her new environment and approached Josta – an old friend from her time spent on a pre-release island – who was dangling from a nearby tree. The two females ended up exploring the forest together and foraging along the way. 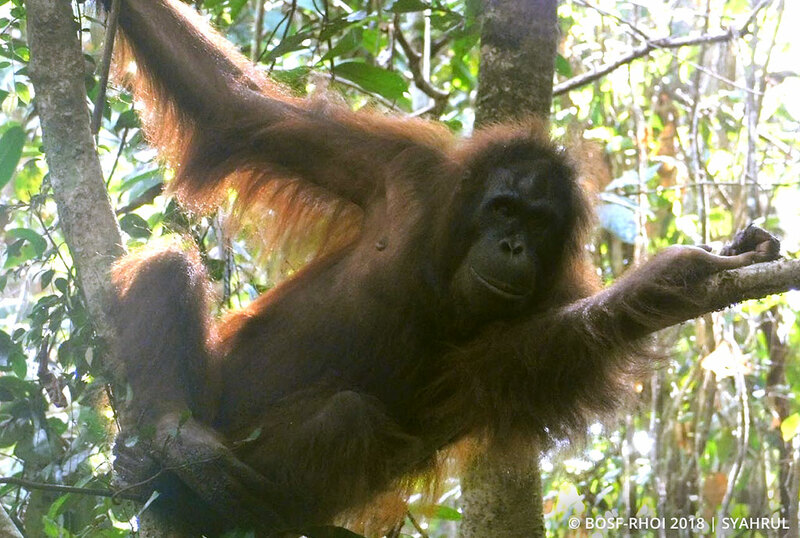 The three younger, more active orangutans in this release group – pals Bieber, Riva, and Restu – chased one another through the trees and foraged together. When the trio finally stopped to rest, they received a surprising visit from their newly-released friends, Menur and Josta! Bieber was the first to take notice and immediately started inching closer to the two females, with Riva and Restu following his lead shortly after. The five then spent some time together; Menur and Bieber enjoyed a spot of wrestling, and Restu somehow found the energy after his long journey to mate with with Josta in the afternoon. Whether their efforts will amount to anything remains to be seen. Filled with a natural curiosity, Riva remained nearby as an interested spectator. Engrossed in their observation task, the PRM team members almost failed to notice that evening was creeping in. After a long and exhausting day, the five orangutans gradually slowed down and started to build their nests to rest in for the night – their first night of true freedom! The team received news that Mads had also built his night nest and was already tucked in for the night. After a full day of observations, the team headed back to camp in high spirits, satisfied that all six orangutans had embraced their first day of freedom. Have a good rest, dear friends! We hope you enjoy your new life in the Kehje Sewen.